Original images captured for the Seattle Parks & Recreation department were published in its 2017 Park District Annual Report. Original aerial image of the Golden Gate Bridge and Marin Headlands was published in the Special Edition of VIEW Magazine (Germany) in October 2018. VIEW Magazine is distributed in Germany, Austria, and Switzerland and features photography of different subject matters. Original image of festive Westlake Park in the heart of downtown Seattle during the holiday season was published in the 2018-2019 issue of Visit Seattle Magazine's Holiday & Winter Guide. 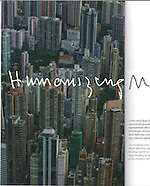 Original aerial image of Hong Kong was published as a full page introduction to the 25-page feature article, "Humanizing Megascale", by Moshe Safde, in the March 2011 issue of L'ARCA International, a popular Italian trade magazine for architecture. This was the very first image to ever be published in a magazine during my career as a professional photographer. Original image of Olympia, Washington was published in the May/June 2016 issue of AAA Journey Magazine (Journey Western). Original image of the Space Needle and Queen Anne Hill in Seattle was published in the January 2017 issue of Visit Seattle Magazine's international edition, which is distributed in France, Japan, and Germany. Original image of Carkeek Park captured for the Seattle Parks & Recreation department was published in its 2016 Park District Annual Report. Original senior high school portraits published as graduation party invitation cards. Original images of Los Angeles were featured on DiscoverLosAngeles.com's website in 2012 and 2013. Original image of Hong Kong was featured on CNNGo.com''s article titled "How To Take an Iconic Hong Kong Photo" in August 2011.